We’ve developed a plan for Dulwich Hill that maintains the ‘village like feel’ and provides opportunities for new homes and shops near the metro and light rail station. Have your say. A local centre that provides a high quality living environment with good transport connections. Pockets of new homes will help to bring a greater range of activity and housing options to Dulwich Hill. Support the heritage and conservation areas which contribute to the character of the area along with the ‘village-like’ feel of the neighbourhood. Improve the quality of the footpaths, street trees and lighting, especially around Wardell Road and the metro station, to create an enhanced local centre. 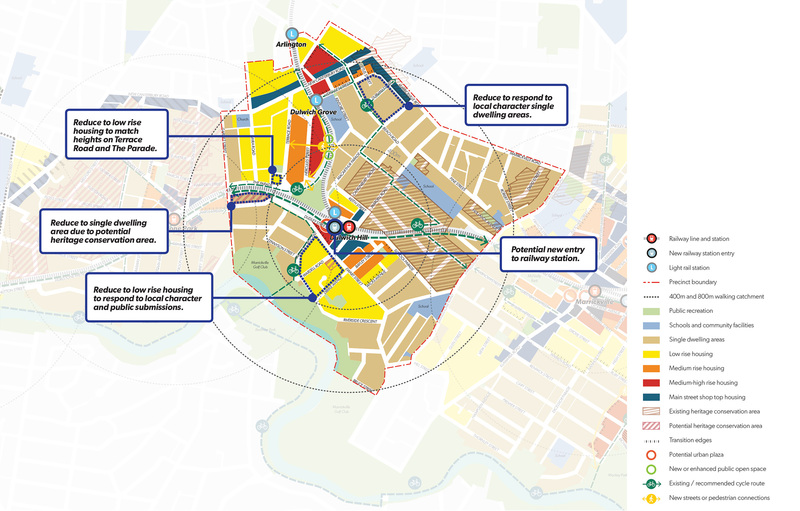 This map shows the key changes that have been made to the Dulwich Hill Station Precinct Plan as a result of your feedback. Construction of Greenway Inner West Council will complete the ‘missing link’ of the Greenway connecting Iron Cove to the Cooks’ River. Public Domain and Station Access Plan Sydney Metro will prepare a Public Domain and Station Access Plan for improved station design, accessibility and interchange with other modes of transport. The new metro station at Dulwich Hill will provide improved pedestrian and bicycle access. Heritage Conservation Inner West Council will prepare a planning proposal to formalise the protection of potential heritage conservation areas on Ewart Street and Wardell Road. Growth needs to be focused on industrial and under-utilised land such as New Canterbury Road. There is some support for redevelopment on Hercules Street provided impacts on surrounding existing dwellings are managed. Biodiversity, particularly the impact on the long-nosed bandicoot needs to be considered. Increased development needs to be supported by improved parks and open space. More detailed information on your feedback can be found in the Dulwich Hill Station Precinct Plan.